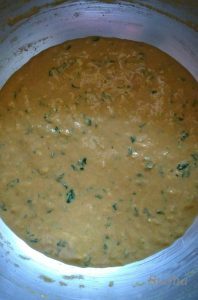 This is a Goan / Konkani dish. 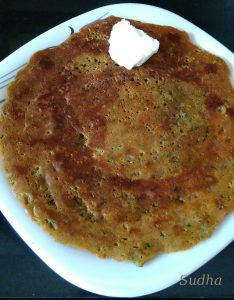 Methi / Fresh Fenugreek gives a slight bitter taste to this sweet Bhakari / Pan Cake to make it delicious. This is a healthy and quick breakfast / snack dish. 2. Add water as required and mix to get a consistency thicker than Bhajia / Pan Cake batter. 3. Heat a flat non stick Griddle (Tava). 6. After 2-3 minutes, put a few drops of oil/butter on Bhakari and flip it over. 7. Cook both sides to get light brown colour. Serve hot with Ghee (Clarified Butter) / Butter. 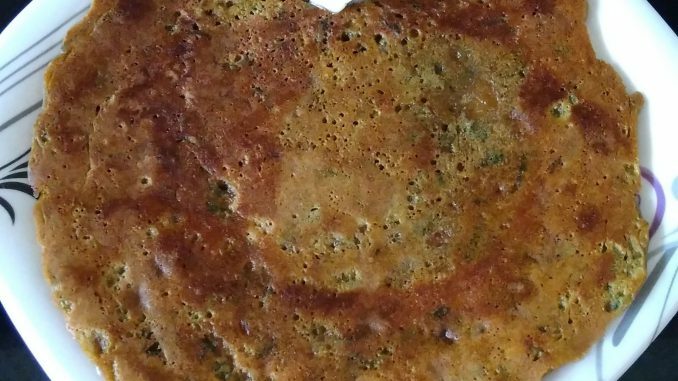 This delicious Bhakari tastes good without Ghee / butter also.